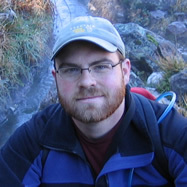 Director’s Postdoctoral Fellow Theodore Flynn (BIO) from Argonne’s Molecular Environmental Science Group was recently awarded a “Certificate of Merit” from the American Chemical Society’s (ACS) Division of Environmental Chemistry. 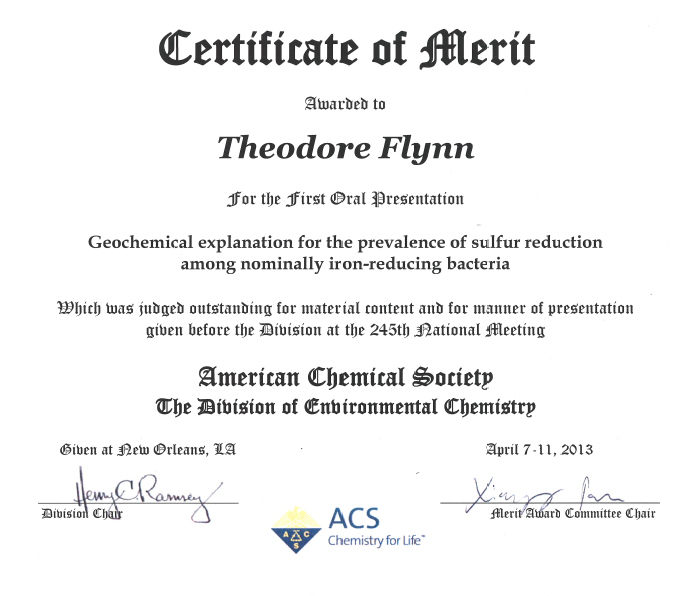 The certificate was in recognition of Flynn’s presentation “Geochemical Explanation for the Prevalence of Sulfur Reduction Among Nominally Iron-reducing Bacteria” given at the 245th National ACS Meeting in New Orleans, Louisiana. The ACS recognizes members who are making landmark presentations for the first time before a national meeting of their peers. As a Director’s Postdoctoral Fellow, Flynn has investigated how microbial communities mediate the biogeochemical cycling of iron, sulfur, and carbon. His research integrates geochemical modeling and metagenomics with laboratory incubations of anaerobic bacteria to greater understand the nature of microbial activity in the subsurface. The American Chemical Society (ACS) is the world’s largest scientific society with more than 163,000 members and one of the world’s leading sources of authoritative scientific information. A nonprofit organization, chartered by Congress, ACS is at the forefront of the evolving worldwide chemical enterprise and the premier professional home for chemists, chemical engineers and related professions around the globe. This entry was posted in Distinguished Fellowships and Divisional Postdoctoral Appointments, Postdoc Awards and tagged acs, american chemical society, award, flynn, theodore flynn. Bookmark the permalink.